Creede, Colorado is a no-man’s land, swarming with dust and sparsely populated with weathered horses and leathery-faced cowboys long divorced from a ranch. The landscape is peppered with corpses and animal carcasses, creatures dropped dead in the middle of the Old West. In “Godless,” which debuted on Netflix last Wednesday, Creede is a vast expanse of beige mortality bearing the trademarks of the classic western landscape — a sepia-toned exposition of outlaws, guns and sun. Other towns and settlements suffer a similarly bitter existence — one that contributes to a permeating sense of the Wild West. The majority of the pilot episode bears a perplexing juxtaposition. Snippets of dialogue act as jagged pieces of a puzzle that does not form a picture as much as it forms a scrap pile of suede faded by suffering and hard-wrought survival. The characters, introduced by their relation to a vague situation, are far from happy, the cause being little more than the trials of western settlement. But once it does, it is difficult to turn away from its layered tales of heartbreak and ruthless humanity. Lengthy episodes make it an exhausting binge-watch, even for a mini-series, but the grippingly dramatic series is still intriguing, characterized by engrossing, stoic performances and dialogue that is weighted by physical pain and pivotal loss. Among those performances are Michelle Dockery as a hardened Alice Fletcher living with her son, Truckee (Samuel Marty) and his Piute grandmother (Tantoo Cardinal). Dockery gives a riveting force to her character in a steadfast portrayal of independence. Widowed twice before the age of 21, Fletcher is characterized by strength and driven by quick-draw impulses, yet displayed hesitance when accepting newcomers. Dockery’s ability to fuse her character’s power and fear is worth noting, as it facilitates the show’s transition from jagged exposition to engrossing serial. Captivating, too, are the hardened “Ladies of La Belle,” husbandless and perhaps better for it. Widowed by an accident that took out many of their spouses, some are more resistant to outside assistance than others — Mary Agnes (Merritt Wever) being the most steadfastly independent among them. Wever grants her character a brash sensibility and fierce retorts — to those who attempt to patronize her, Mary Agnes flips a metaphorical middle finger to the literal man. The men of the series are by no means an afterthought of the show’s creators — rather, they are treated as characters of equal emotional depth, some with far greater merits of moral character than others. Certainly, there are those who are uncomfortably domineering, posing all-or-none offers of financial assistance and bearing characteristically know-better personas — namely, A.T. Grigg (Jeremy Bobb) is disconcertingly assertive. Yet there are also tinges of emotion and complexity to several male characters of note, including Jeff Daniels, as a malicious and surprisingly charismatic Frank Griffin. Griffin is, like most of his cohort, weathered by his contact with mortality and ambitiously spiteful. But his facade has cracks in its leathery exterior, and Daniels offers glances at sentimentality in his performance. There is also the the striking hollowness of Roy Goode (Jack O’Connell), a notorious instigator of chaos and perpetrator of the incident at Creede. Goode is an ostensible outlaw, but he also bears a sense of loneliness and feeling of loss that aren’t immediately articulated. On paper, he appears to be the most akin to the gun-slinging public enemy of western classics, but O’Connell’s performance has more nuance to it — Goode is far from dismissible as an agitator. Considering the advertisements for “Godless” that promoted it as a mini-series about a town without men, the attention given to the male characters and their overwhelmingly frequent presence in each episode isn’t easily ignored. In the second episode, “The Ladies of La Belle,” one might hope to see more of said women than the limited screen time of their introduction. Even so, the attention that is given to the women in “Godless” is more than a cursory glance at female independence. The series distances itself from the appearance of a completely gender-driven dynamic, lending itself to a more forgivable approach to representation in which strife and emotional weight is borne equally by all characters. 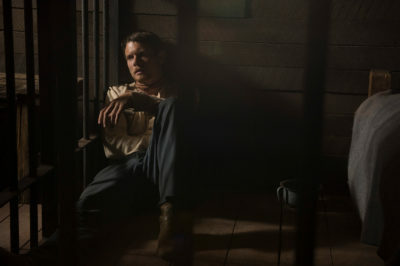 In “Godless,” there is no glorification of a dry and tortured life out West. But there is glory in the its characters, cultivating a sense of riveting urgency and intricate fascination with the bitter tragedy of western settlement.